January 1610 - Galileo first observed the moons of Jupiter on January 7, 1610 through a homemade telescope; including the moon that would later be known as Europa. Launched in 1989, the Galileo spacecraft arrived at Jupiter on December 7, 1995. The spacecraft spent two years orbiting Jupiter; studying the plant and its moons. 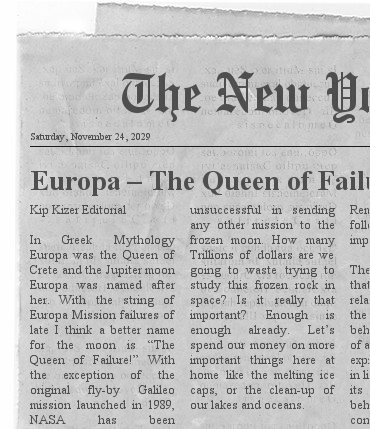 In 1998, the Galileo spacecraft completed a flyby of Europa, within 2,226 miles. 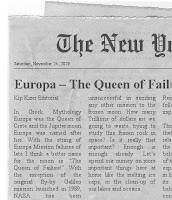 Data from Galileo led most planetary scientists to believe that a layer of liquid water exists beneath Europa's surface, and that heat energy from tidal flexing allows the subsurface ocean to remain liquid. In November 2011, a team of researchers presented evidence in the journal 'Nature' suggesting the existence of vast lakes of liquid water entirely encased in the moon's icy outer shell, and distinct from a liquid ocean thought to exist farther down beneath the ice shell. The lakes are another potential habitat for life. 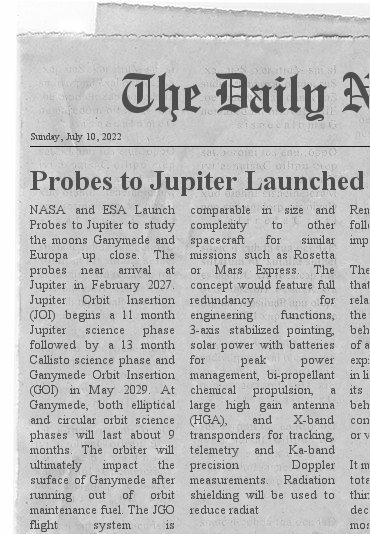 In 2022 NASA and the ESA launched a joint mission to Jupiter for in-depth exploration of her moons with a major focus on Europa and Ganymede. 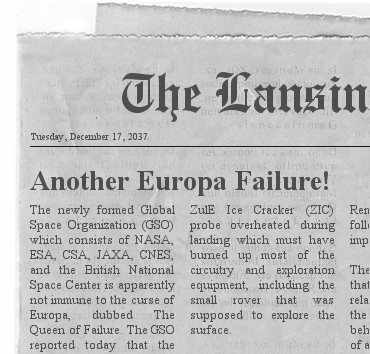 Unfortunately this was the start of a string of failures in an attempt to study Europa closer. During this mission NASA launched the Jupiter Europa Orbiter (JEO) while ESA launched the Jupiter Ganymede Orbiter (JGO) in an attempt to study the moons up close. The JGO performed like a champ to study Ganymede. 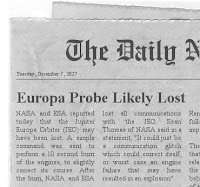 The JEO also seemed to be on a path of success however when it neared the Jupiter system in December of 2027 a simple command sent to perform a 10 second burn of the engines, to slightly correct its course, resulted in disaster. 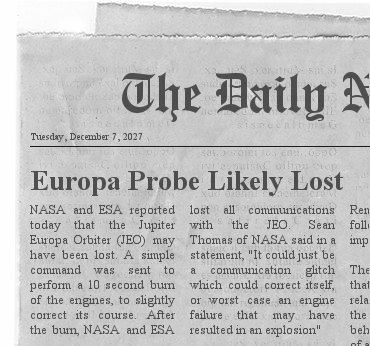 After the burn, NASA and ESA lost all communications with the JEO. In later months when the two probes would have normally passed relatively close to each other the JGO’s cameras and multitude of sensor equipment scanned the region of space where the JEO should be, but found nothing. It is believed that a faulty fuel line may have caused the probe to explode upon firing of the engines. 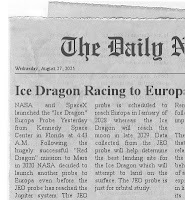 Not to fear though, NASA and SpaceX had already launched an “Ice Dragon” to Europa in 2025 following the hugely successful “Red Dragon” Mars mission of 2020. This lander was going to use data from the JEO to find a prime landing spot, so without that data it was just programmed for what they assume would be the best spot for minimal surface exploration. 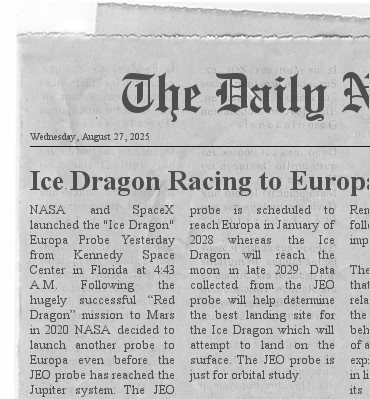 However the Ice Dragon hit an ice plume during its decent in 2029 and crash landed. 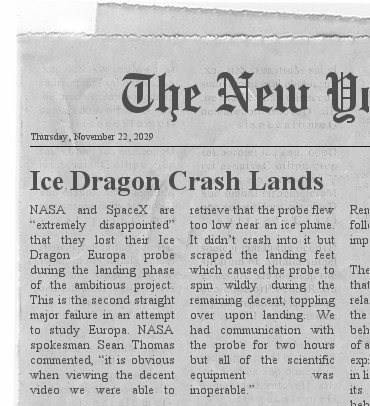 It was able to communicate back to Earth for a few hours but all the scientific equipment was inoperable, including the ability to take surface photos. Over the next 27 years three additional unmanned landing probes were sent to Europa looking to validate the existence of a water ocean under her thick icy surface. Those missions were also mostly unsuccessful though. Since Europa is almost one light-hour away from Earth, it was not possible to do any sort of remote control of a probe so fully automated robotic probes were required. 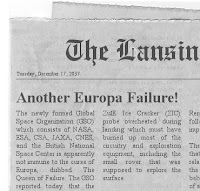 So when the Global Space Organization (GSO) was finally able to land on Europa, ice penetration failed due to poor landing locations so only surface information was gathered. People started to joke that the icy moon was cursed. 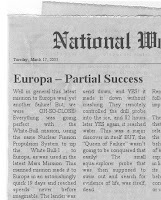 Due to advancements in Nuclear Fission Propulsion, which dramatically cut down travel times, a first ever manned orbital mission to Europa was completed in 2055. 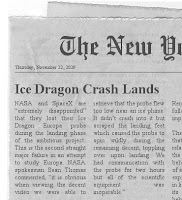 They were able to remotely send down an unmanned lander and finally were successful in sending a nuclear heated missile probe through the ice by remote control. They did confirm liquid water but shortly after reaching the underwater ocean, all communications was lost to the probe. 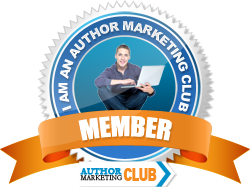 This new mission will send down the first ever manned lander to the surface. On board this lander will be two crews, each with basically the same mission, each will send down a separate nuclear heated probe through the ice. Two chances for success. When the probes reach the ocean, underwater exploration probes will be launched that can be remote controlled to explore the ocean for evidence of life. Samples of soil, rock, and ice will also be gathered from the surface and ultimately returned to Earth. 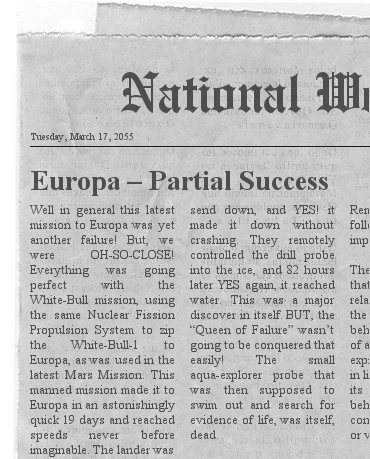 Will this be the first Europa mission that doesn't ultimately end in failure? Will they find evidence of life? 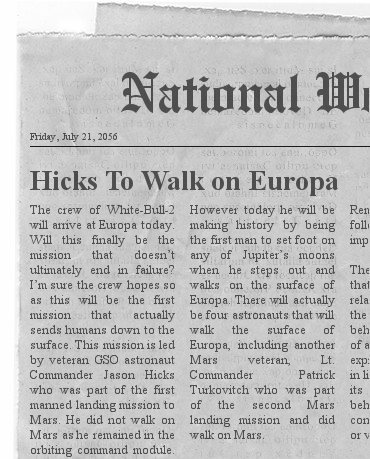 Everyone jokes about the ‘curse’ but with the past history of Europa missions, what is the crew really thinking to themselves in the back of their minds?